The winner of in the Galway County category of ‘A Poem for Ireland’ competition 2016 was Megan Milne-Thompson from Mercy Secondary, Woodford. 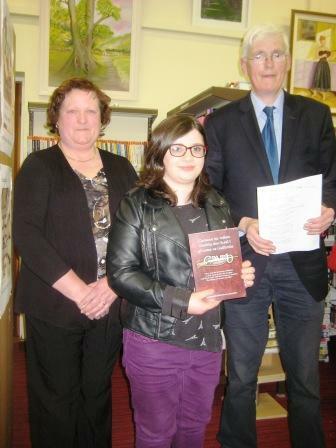 Megan is picture here with Eleanor Farrell of Woodford Library and Peter Rabbitt, County Librarian in Portumna Library 4 May 2016. 100 years to the day on the execution of Joseph Plunkett. We kneel, we pray, we place the bands. So it all ends with a red sun rising. Under our national waving Brand.